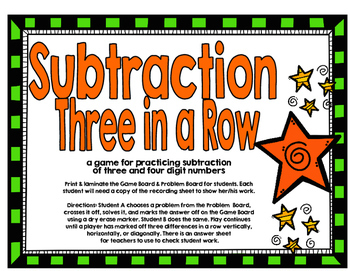 This is a great self-checking game for practice and for review of subtracting three and four digit numbers. 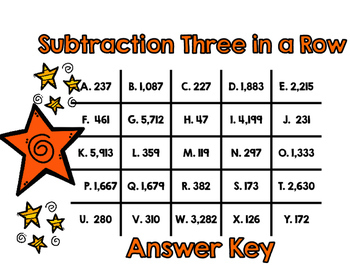 There is an answer key included, but you don't really need to copy it for the students. If the answer the student has gotten is not on the Game Board, the student should rework the problem. 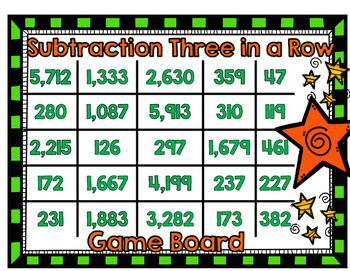 I like to use this game because it motivates students to be accurate and to solve the problems correctly. You are able to watch and see which students are estimating and choosing problems with a specific difference in mind and which students are randomly choosing problems to solve. It makes a fun math center and is easy to set out for early finishers. Print & laminate the Game Board & Problem Sheet for students. 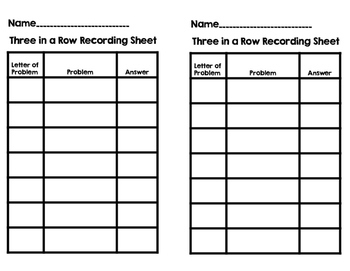 Each student will need a copy of the recording sheet to show her/his work. for teachers (or students) to use to check student work. A student recording sheet is also included. This game can also be played with three players.